About the work: I think we function in orbits. We circle things all our lives. That’s what these letters to Psyche are about: the way we circle, cycle, to and from the same things. Lily, for example, goes through three phases of an orbit with each set of three letters. The first is isolation. The second is hesitation. The third is association. Engagement. Burrowing into the world instead of, as in the first sections, away from it. Each set of three letters has a repeated line. In the first, it appears early on. In the second, about halfway through. The third features it at the end. These lines change as Lily does. She is dreaming of being lost, then found, and then not dreaming anything at all. A sign of healing, perhaps. It can be easier to talk to things like Psyche instead of other people. Times of struggling. But, as Lily demonstrates, it can’t last forever. 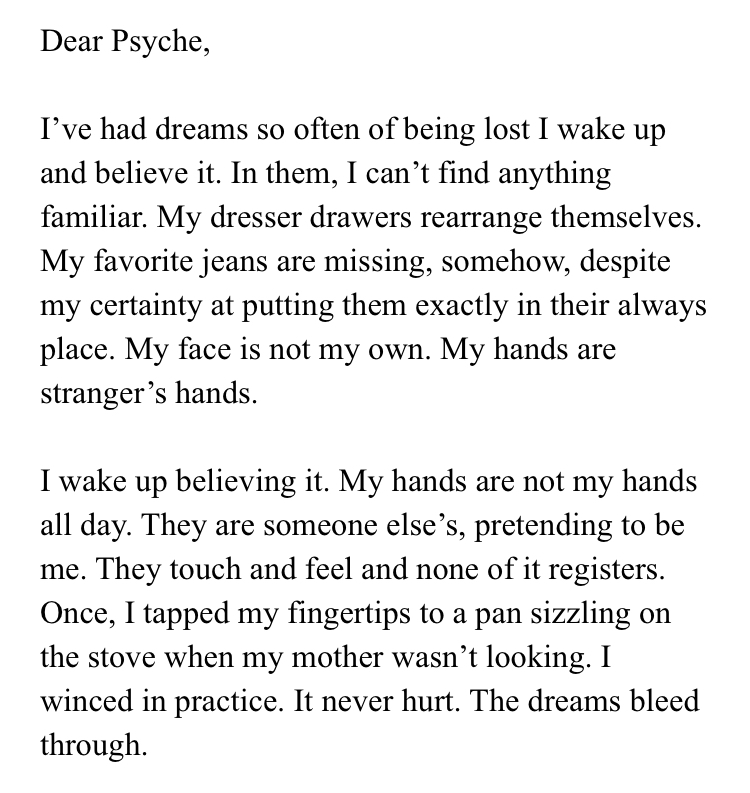 Find comfort in things like Psyche, sure. How they parallel your hurt. Your life. Your isolation. But, also, let people in, too. Psyche might have been through a lot, but it can’t talk back. Isolation to hesitation to engagement. You need all three to complete the circle.